Michelle Davies | The Journal Gazette Keegan Laycock of Fort Wayne takes a selfie with his son Paxton, 2, with Mark Prior behind him. 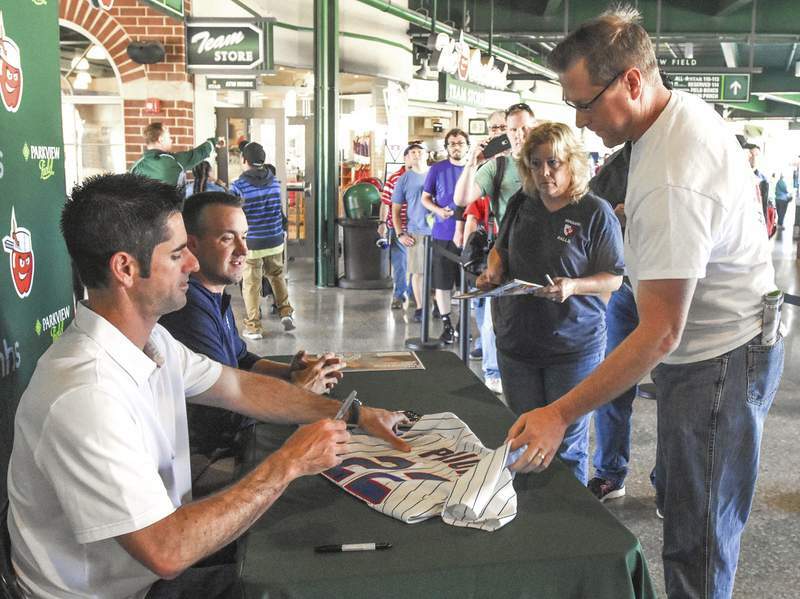 The former Cubs ace was at Parkview Field signing autographs Wednesday before the TinCaps game. 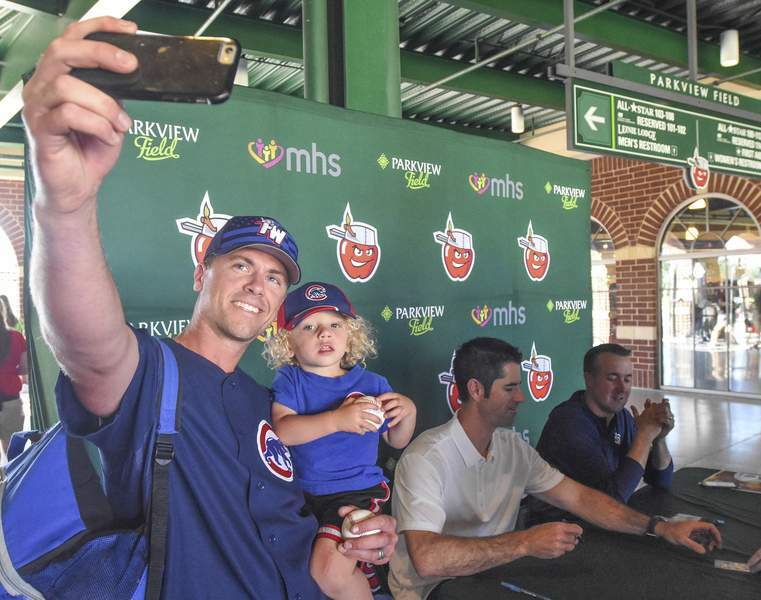 From jerseys to action figures, the 300 Chicago Cubs fans who gathered behind Parkview Field's home plate concourse had just about everything for former All-Star pitcher Mark Prior to sign. But signing autographs wasn't the main reason for Prior's visit to Parkview Field on Wednesday before the TinCaps played Lake County. Prior is the San Diego Padres minor league pitching coordinator, traveling to each of the organization's minor league affiliates to check on the progress of the Padres' young pitchers. As a player who made his major league debut with the Cubs in 2003 as a 21-year old, Prior has given the TinCaps' pitching staff a role model with big-league experience. Allen, who came over to the Padres' organization in the 2015 trade that sent closer and five-time All-Star Craig Kimbrel to the Boston Red Sox, is 3-3 this season with a 1.75 ERA. The 20-year old southpaw was named a 2017 Midwest League All-Star on Wednesday. Apart from helping pitchers make adjustments, Prior also noted the importance he stresses to young players about appreciating their time in baseball, something the 36-year-old wishes he could've told himself at the start of his professional career. In his third season as the Padres' minor league pitching coordinator, Prior continues to take his baseball experiences as they come, a mentality he's embraced over his time with the Padres' front office. “I feel that we have a pretty big responsibility of trying to keep promoting this talent up through our system and hopefully help our big-league team,” Prior said.